kadsur: Zero to 100 in 24 hrs...!!! As i stood next to State Central Library on Sunday morning, a red building facing Hudson circle, next to it beautiful rose garden, trimmed well and just watered due to light drizzle all through previous day. Sun was playing hide and seek with the cloud was adding all the more beauty to the surrounding. As i just watched saw a biker riding in the slope, moving confidently as she just disappeared i had a smile on my face and soaked in joy, happiness, satisfaction, i lost in my own world only to realize she came back and stopped the bike in front of me. Just an hour back me, Murali, Srinidhi, Zubin and Rajesh we were having breakfast at airlines hotel post volunteer meet at Cubbon Park for Cycle Day. My phone battery went dry as i have asked Indu to come to Airlines Hotel at 9.30 am (whom i have never met before, through BBC she wrote a mail shown interest in learning 'how 2 ride a bike'). I was wondering how do i recognize her, if someone visited airlines hotel on Sunday morning will understand what i am referring to, it is really difficult. We were having some serious discussion along with having breakfast. Suddenly i stood up from the breakfast table, said just a minute and walked towards the entrance of the hotel. I saw a girl entering the hotel, i guessed it right she is Indu. 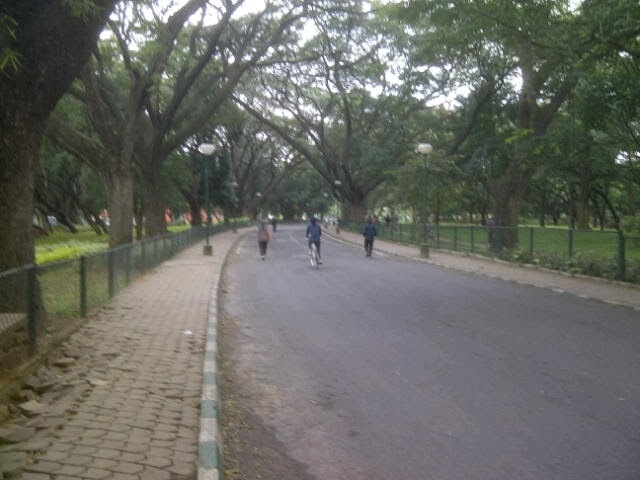 To Cut it short, after the introduction and breakfast we headed to Cubbon Park. Found a road next to the Library is the best for teaching. She started off after few meters went and hit the foot path and fell along with the bike. Small bruises on the left feet and hand. I felt it was a good start, you have already fallen what else can happen, nothing more, gave some positive affirmations and she started off on the saddle again. It only went on improving with a baby steps in an hours time. 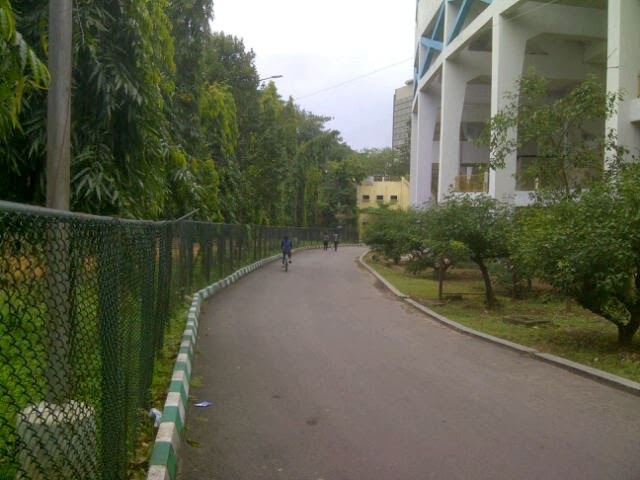 As a final sign off she rode back on that inclined road and reached the State Library (we met Amit and Hema who were returning after the volunteer meet and they are from BMS-which is having one of oldest cycling club in Bangalore). Had a glass of fresh sugar cane juice at Hudson Circle and left as we decided to meet Monday morning at 7 am. 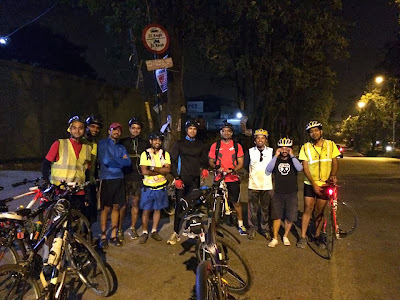 We decided to start the ride at Kanteerava Stadium it is more of a flat stretch we did not need a descent terrain any more. I was running next to her and she was riding the bike (i got an opportunity to run after long time) now and then unexpectedly coming in her way and teaching her immediate braking, she need to come off the saddle and firmly holding the bike and not allowing the bike and herself to fall. Making sure she rides in a line, speeds up, slows down, suddenly applies brakes and then takes off. She did really well. 15 days before a good friend Sunil a runner bought a MTB been looking for dates to join me for century ride, ie going to be his First Century. For continuous two Saturdays i did Mysore and back, i was feeling uncomfortable(in fact wanted do a hat rick by doing Mysore and back again) as i did not given him the time (i was working one of the Saturday too....). We decided 16th is the day, route is going to be Janapadaloka and back and start time is fixed as 5 am and starting from PES IT, as he wanted to be back before 11 am. Previous evening i sent a sms to couple of biker friends with whom i regularly ride, had quite a good response to it, we had 11 other bikers showing up and taking the total to 13 bikers. 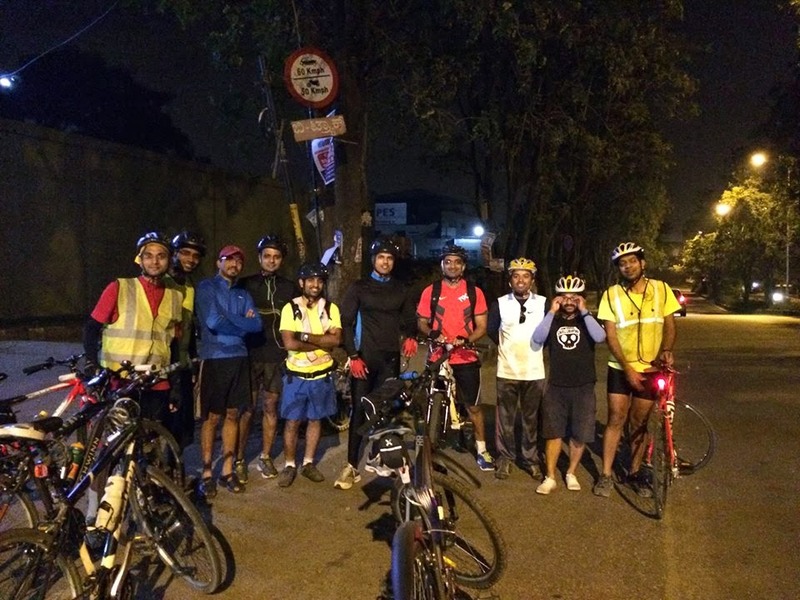 We all started at 5.12 am, Anand was in his road bike and every one else on either MTB or Hybrid. Just briefed the breakfast point is going to be Janapadaloka and that is the U-turn point also. As we all started off everyone just went off with full speed, i was riding 'My Bike' a single speed steel bike, became last of the pack. I was really finding it difficult keep up the pace, it looks like this bike is good for commute within the city, for longer distances up to certain pace it is fine beyond that it will not take it. After few kms i could catch up with Ram as he started biking again after 5 months gap was riding it easy, who bought a 2nd hand bike previous day. Rode with him for some distance and took off as he gave me green signal to go ahead. As kms started passing by met Rahul who just recently completed GMC we spoke for a while and listening to his experiences of the tour. Then met Ramswarup who was also doing his First 100, he was enjoying the ride listening to the music (good show buddy, on completing your First 100 kms). By 7 am i reached Janapadaloka by then already 6 of them have reached. Anand raman, Dileep vaka, Prarabdh awasthi (all three of them are doing Tfn this year). Sunil and Venky (both are runners and colleagues). As we were having breakfast Dr. Shankar and Dr. Ramesh reached there to have a cup of coffee with all of us, so kind of you and thanks for coming. We spent 1.15 hrs there having yummy breakfast as we are talking then i suddenly remembered 3 days before i donated blood and i was not even carrying water bottle. As we are about to leave Arokia raj joined us who started an hour late, who recently upgraded to road bike (he did not stop for breakfast rode with us immediately). Return ride i rode with Sunil, it was more of a chatty ride giving him company as he was doing his First 100. He is basically a runner and regular at gym. Did very well considering he was doing his first triple digit. I also made it a point talk everything under the Sun and shifting his focus from cycling. We stopped just after NICE road junction for a tender coconut, reached their respective places just before 11 am, good show buddy. These two things keep me charged up all the time, First teaching some one 'How 2 ride a bike' . What i have seen over the years is, it brings a positive shift when they learn how to bike. It is also about the freedom and convenience if someone has to commute shorter distances, no doubt it is best mode of transport to explore new places and especially a city like Bangalore. Second one being part of someone who is doing his First 100 kms on a bike. I feel it is paradigm shift and a right move in moving on to endurance or in keeping biking as a healthy hobby to keep oneself Fit in today's world. Thank you for the encouraging words. I am surrounded by people who are so positive and bring lot of energy. Thank you, i was always wondering how do i write a short one and still there is something interesting to read, looks like i made beginning. I remember my first 100 ride you supported me. Thanks and really appreciate the way you keep supporting. Thank you. Yes i do remember, sure will let you know, i keep that as a first priority all the time. That gives me lot of kick. Thank you. I wanted to connect both, found a way of doing it, appreciate you always have time to read it. good stuff Anil .. nice job you are doing inspiring other people to spread positive energy ! Thank you for the kind words, you taking time to read this, am moved. thank you once again. A great one Anil. Like you rightly said, everyone very fondly remembers their first 100K -- and more importantly all the people who make it possible. In my case, it wasn't just the 100 K ride, but the whole journey was possible because of you. And only you. 1. I had my first bike ride on your bike (and thanks to another friend of mine who actually was with me for the entire 20K). 2. That long conversation outside my apt gate when you came to take your bike back. 3. Those precious 2 hours at Cadence90 when I had a million questions on how to go about choosing a bike (and the ride back home from that store). 4. And needless to say the 100K. I can't wait to embark upon the 200K ride with you. I hope we do it sooner than later. But it's not just about me. I see how you have been a very inspiring figure to a lot more people and that speaks volumes about your selfless personality. Thank you buddy for all the kind words. At times i keep wondering do i deserve all these pats on my back, i just do it because i love every bit of it and enjoy doing it. Sure will head for 200k shortly. Thank you for all the kind and encouraging words, appreciate you could get time to read this post. Thank you dude. Wish some day it happens too. Appreciate you took the time to read. Good one Anil. Truly inspirational. Thank you dude for the kind words. Great write up. Great job too. Well done. Thank you sir. appreciate you took time to read it. Enjoyed that very much! Long may you keep up the worthy intiative of teaching others to cycle. Thank you. appreciate you took the time to read it. Perhap it sounds a bit grandiose to borrow the title of the Irving Stone novel to describe something like learning to ride a bicycle. But when you’ve spent 29 years not knowing a skill most people take for granted (“But how can you NOT know how to cycle” is the usual response. Or just “Howww”), you can’t help but feel pretty damn good about it! But I get ahead of myself -- the agony, first. I’d emailed Mayank Rungta of BBC first, asking if he may be able to help me learn to ride a bike and he told me Anil Kadsur is the man. To all those who know him, that will not come as a surprise. And to those who don’t, I repeat -- he is THE man. After various mails back and forth, it was decided that Sunday morning would be D-Day. Anil took me to a particular stretch in Cubbon Park which has a slight incline, something he said was crucial to first-timers, since it helped you gain momentum. His technique is not to push you from behind but to let you ride alone, from the word go. He also emphasised that there is nothing to worry about. But I was terrified, and convinced that I would fall. And sure enough, I did, wham! The fall did not do much for my self-confidence and Anil admitted later that he felt it might not be easy to get me cycling. What helped me get back on the saddle were Anil’s constant encouragement and “positive affirmation” (I had never been told ‘awesome’ so many times in an hour -- and it worked like a charm!) and the realisation that I could stop the bike at will. So here’s the thing -- I’m 5 feet 6 inches which means, in theory, that I just have to put my feet down at any point and the bike would naturally stop. But for some reason I could not imbibe that completely and I finally started cycling only when I started using the brakes. By the end of that first hour, I could cycle up and down the stretch we’d chosen to practice on. Unfortunately, this late realisation meant that at the next day’s session, I not only failed to stop the bike in time, I knocked over someone in the process, before falling again. It was a bit traumatic, to put it mildly (I can see the funny side now but it was no joke when it happened) That shook my confidence badly and though I practiced again, I was tense most of the time, though Anil kept telling me that I should not think about it, and concentrate on the positives instead. I spent most of that day, even at work, feeling miserable. And then there was Day 3. Anil told me he had never spent so much time on a “student”. His lesson was usually confined to that one hour or half an hour, by the end of which the person would be able to whizz off on her bicycle. But with me, here we were, on a third morning! The third day, I am happy to report, was all ecstasy. Anil finally made me realise I could stop whenever I wanted (especially if there was a person in the way!) and I could cycle off, without overthinking it, or feeling tense. I managed to do some 10 rounds, which in my head is a miracle. And it felt great! Thank you, appreciate and acknowledge it. 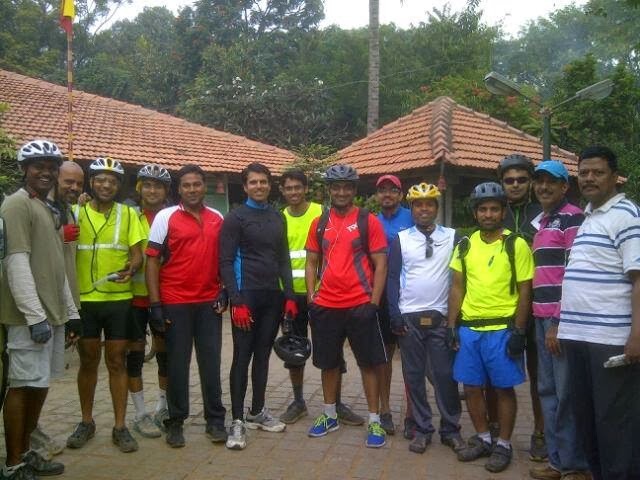 Anil, you are doing a fanstastic job in the cycling space. Bike shops also have their morning or night rides...and races...and then there are brevets. Also there are some events like group riding for a cause etc. Just riding with people to make them either learn or become more stronger -- without expecting anything from them is what you are doing. Keep it up. Great job. Thank you, appreciate you taking time to read it, am humbled to read your words. Thank you, appreciate you taking time to read it.